Converting a physical machine to a virtual machine is one of the first steps you tend to do once you have your virtualization environment all set up. Physical to Virtual or P2V conversions can be performed in number of different ways. 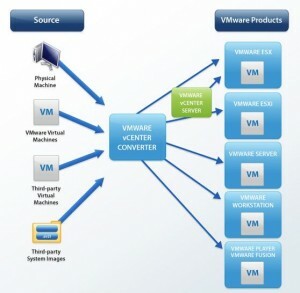 In this article we are going to explain how you can use VMWare’s free tool called VMWare vCenter Converter to convert a physical machine to a virtual one. VMWare vCenter Converter is a very versatile tool that lets you do a variety of conversions. You can convert physical machines to virtual, you can convert virtual machines from third party (such as Microsoft’s Hyper-v or Virtual PC) to VMWare virtual machines. You can also convert VMWare Virtual Machines (for example from an earlier version) to VMWare platform. All these converted virtual machines can now be utilized on VMWare products such as ESX server, VMWare ESXi, VMWare server, VMWare workstation and VMWare Fusion. When installing VMware vCenter Converter, you can deploy it locally or in a server mode. Local deployment will install software on the current machine so that it can only convert the local machine to a virtual machine. In server mode, the agent is pushed out to a remote machine and a P2V conversion is performed. It’s very important to sort out authentication and firewall issues on remote machine when you are trying to do this.